5 tilt positions with fixed or 360° grille rotation. Two fixing points for wall mounted installations. Large stable foot for floor standing. Grille rotates rather than oscillates. Fixed grille position can be selected. The ultimate desk fan! The Meteor Cooler provides a refreshing, modulated airflow to improve the atmosphere in the home or create an ideal working climate in the office. It can be free standing or wall mounted. 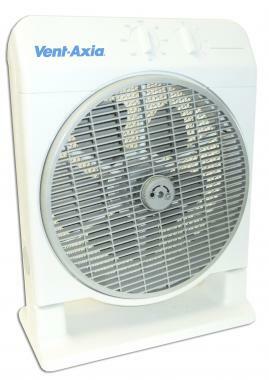 As a wall mounted fan, horizontal, vertical and three intermediate positions can be used. When free standing, Meteor can be set vertical or tilted back at 22° or 45° to give excellent directional control. Separately switched, the revolutionary Cyclotherm action air deflector will rotate continuously to disperse and direct air wherever it is needed. If touched, the rotating grille will stop and reverse with a gentle action making Meteor extremely safe. BEAB Approved. Three speeds, 550, 850, 1100 rpm. Tiltable: 0°, 22°, 45° plus 67° and 90° when wall mounted. The ultimate desk fan! The Meteor Cooler provides a refreshing, modulated airflow to improve the atmosphere in the home or create an ideal working climate in the office. It can be free standing or wall mounted. As a wall mounted fan, horizontal, vertical and three intermediate positions can be used. When free standing, Meteor can be set vertical or tilted back at 22° or 45° to give excellent directional control. Separately switched, the revolutionary Cyclotherm action air deflector will rotate continuously to disperse and direct air wherever it is needed. If touched, the rotating grille will stop and reverse with a gentle action making Meteor extremely safe. BEAB Approved.